Photo: William Paca House and Garden, ca. 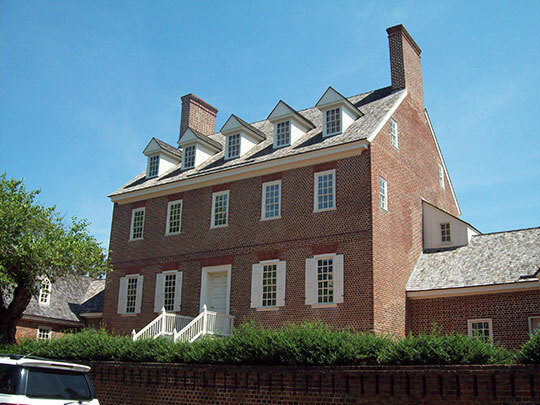 1764, 186 Prince George Street, Annapolis, MD. Listed on the National Register of Historic Places in 1971. Photographed by User:Pubdog (own work), 2009, via Wikimedia Commons, accessed July, 2013. Anne Arundel County Courthouse is located at 7 Church Circle, Annapolis MD 21401; phone: 410-222-7000. Anne Arundel county was erected in 1650, and has an area of 400 square miles. It was named after the Lady Anne Arundel, whom Cecilius Calvert married. It fronts eastward on the Chesapeake, and within its territory five rivers are contained — the Severn, the most beautiful sheet of water of its size in the United States; Magothy, South, Rhode, and West. On the north and northeast is the Patapsco, and Howard county lies northwest of Anne Arundel. The Patuxent separates it from Prince George's on the west, and Calvert is on the south. The railroads are the Baltimore and Potomac; Baltimore and Ohio; Annapolis, Baltimore and Washington; and Baltimore and Annapolis Short Line. St. John's College, the alma mater of many distinguished Marylanders, is at Annapolis. Anne Arundel institutions have been notable in the educational annals of Maryland.